I was totally awe-struck the first time I entered the beautiful garden area. A cool breeze was blowing through the olive trees, which in some cases, are 1000-1500 years old. A holy silence ran through the area. I found it hard to believe that this place, The Garden of Gethsemane, was the place where Jesus felt more fully the weight of the world on His shoulders. I so often forget the details of the account. Not once, not twice but three times Jesus pleaded with the Father about letting the cup pass from Him. The cup referred to is what we now call the Cup of Wrath. How could a place of such peace at one time in history function as the place of the most anguish one man will ever feel in the history of the world? How striking that Jesus would come to this place of all places. You see, Gethsemane literally translated means, “a place for pressing oils”. Now, what in the world would an oil press have to do with what our Messiah, Jesus, went through on that most horrific night? Olive trees, olives, olive oil – these all form the backbone of life in Ancient Israel. From the Olive trees are derived food, oil for lamps, wood for building, anointing of kings. The list goes on. A pretty important commodity in Israel. What’s fascinating is the process from which the oil is derived. Bunches of olives are place in a circular, carved out stone. 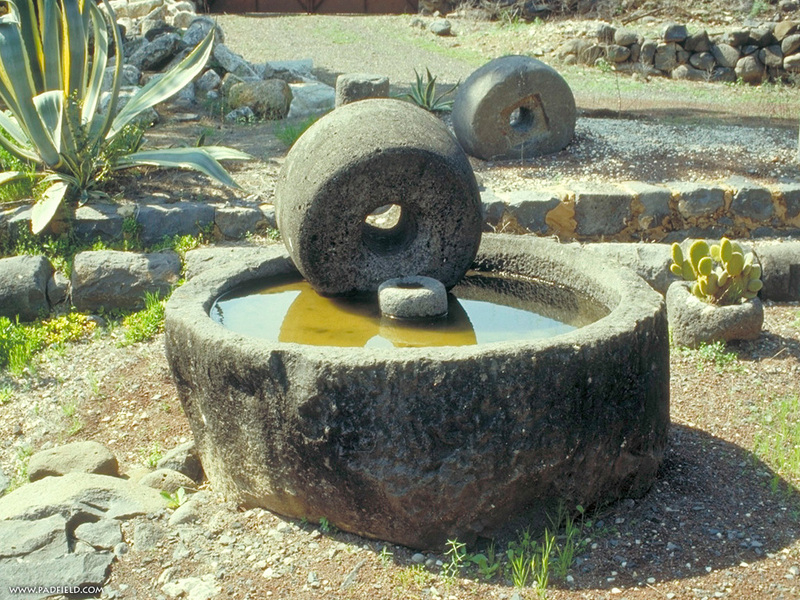 A very heavy circular stone is placed on top of the olives and this stone is pushed around the main stone vat by a donkey. Round and round the crushing goes. Each time Jesus goes to the Father to pray, it’s like that much more is being pressed out of Jesus. He was pouring out His soul on behalf of mankind. He goes back the second time and that much more is squeezed out. He goes back for yet a third time and “every last drop” is squeezed out of Jesus before He is arrested. I can’t begin to imagine the anguish as Jesus was literally submitting Himself to the Oil Press of Sin and Judgment. He had the cross to go yet. But I believe this was the point in the process where Jesus was literally emptied out so that He could more fully take on the role of substitute, sin-bearer, the Lamb led to slaughter. Are you facing your own “pressing engagement”? Are you finding yourself in a situation where it feels like your very life is being squeezed out of you? Perhaps you are finding yourself at your own Garden of Gethsemane experience. How can we apply this to our situation right now? Thankfully, God is a big God and He can handle any and every question we throw His way. He loves us and wants us to be honest with Him. He knows that the more He empties me of myself, the more He can fill my life. Reminds me of John the Baptist’s quote – “I must decrease…He must increase”. What ever, and I mean, what ever you and I face in life, we must remind ourselves that Jesus is our High Priest who can sympathize with every pain we face. He’s been there! While God is pressing on us, He is also impressing in us!